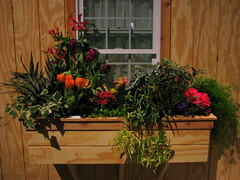 The Chicago Flower and Garden Show will be held March 5-13 at Navy Pier. I am as always very excited! The garden show is one of the first harbingers of spring, the perfect way to transition from winter to the growing season (though of course we still can't plant until mid-May). 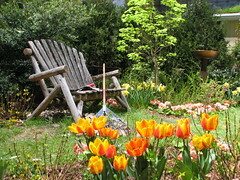 Think of it as "spring training" for the gardening season! This year's theme is "The Sport of Gardening," and I'm interested to see how this theme is integrated into the display gardens. The display I'm especially excited about is one in which Phil Schliefer of Unique Landscapes will show visitors how to turn their backyards into a dog agility garden. Dogs and gardens: two of my favorite things! And of course, always tantalizing is the marketplace, where all the cool garden-related products you've ever wanted are brought together in one glorious room. I already have plans to meet up with various friends at the show, every one of whom I met on-line through blogs, Twitter, or Facebook. Pay no attention to those grouchy sorts who think technology represents the end of human interaction! Sharing information on-line about plants and gardening has become an important part of my gardening routine, and during the off-season there is an active "hot-stove league" of gardeners yearning and planning for the new growing season. I can't wait to emerge from my winter hidey-hole and visit some gardens with my friends again. 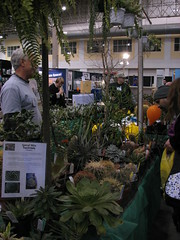 The Chicago Flower and Garden show runs March 5-13, 10-8 Monday-Saturday and 10-6 Sundays. Admission is $13-17 depending on the day and time. $2 discounts are available on Diet Pepsi cans and through your Chicago Botanic Garden membership. Parking is available but I will be taking the CTA and you should, too! See you there! Hope to see you at the show Diane! After going to the Garden Show the past two years, it's becoming an annual tradition for Beckie and me. It's definitely a great way to get inspired for spring! The dog agility display sounds so interesting; maybe Phil can provide some tips for keeping my Sophie from digging around in the garden, too:) Beckie, Lisa, and I will be there the first Sunday--hope to see you again, Diane!